Okay, was it really any surprise that someone created a crossover of John Krasinski’s latest horror-movie hit, A Quiet Place, and old episodes from The Office? When news of Krasinski’s latest project came to fruition, it was a difficult pill to swallow for fans of the Office. While Krasinski may shine as a father who is trying to save his family from an evil force, it’s been challenging for fans to get Krasinski’s prior role as Jim Halpert on The Office out of their mind. It’s no secret that we all had a difficult time sitting through A Quiet Place without seeing Krasinski look straight into the camera with an emotionless expression. So, to help us with our varied emotions regarding Krasinski’s new role, Media Muse created a video mashup of A Quiet Place and the Office. Titled A Dwight Place, the results are as hilarious as they are terrifying. Deciding to take a few A Quiet Place-esque episodes from the show, Media Muse created a pretty intense trailer. To create the trailer, they used clips from season eight’s “Trivia,” where the gang tries to see who can stay quiet the longest and a few episodes where Dwight’s strange cousin, Mose, makes an appearance. 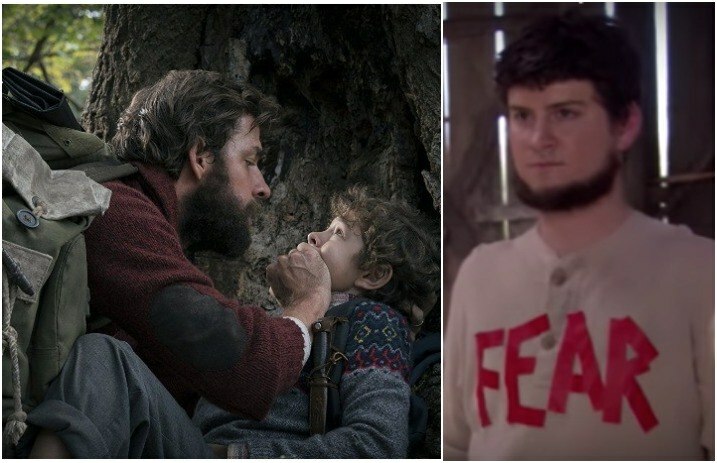 After some impressive editing, the parody features Mose as the person being the “monster,” because let’s face it, he was pretty creepy in the original episodes, and he’s even more strange in the mashup.